Of all of the genres and sub-genres in film, the mockumentary may be one of most under-represented and most misunderstood. The term "mockumentary" refers to a movie which has the look and feel of a documentary, but the subject matter at hand, no matter how realistic looking it is, is an artificial conceit. The films are also typically comedies. This concept had been around for years, but it was 1984's This is Spinal Tap which really revolutionized the form. Christopher Guest, who starred in that film, took up the reins and made four "mockumentaries" himself. Examples of the genre pop up every now and then, but the problem in recent years is that people have come to confuse the glut of "found-footage movie" with "mockumentaries". While they certain seem similar, most "found-footage movies" are A) horror films, and B) more about coincidental video footage of an event, as opposed to a (fake) deliberate attempt to make a movie. Therefore, the appearance of What We Do in the Shadows, an actual "mockumentary" was quite welcome. What We Do in the Shadows focuses on a group of vampires who live in New Zealand. The four blood-suckers at the center of the film are all hundreds of years old and share an apartment. (Which is more like a house.) Viago (Taika Waititi) is very fussy and likes to be the social planner and likes to keep the place tidy. Vladislav (Jemaine Clement) likes to entertain the ladies. Deacon (Jonny Brugh) is the bad-boy of the group who doesn't like being told what to do. And Petyr (Ben Fransham)...well, Petyr lives behind a rock in the basement and he doesn't say much. We watch Viago, Vladislav, and Deacon go about their daily...well, nightly...lives which can involve going into town to look for victims, getting into scrapes with the local band of werewolves, and doing some light cleaning. When a brash new vampire comes on the scene, he threatens to expose the housemates and expose their way of life. What We Do in the Shadows comes from Clement, who was part of Flight of the Conchords and has since become a popular comedic actor and Waititi, who worked on that show and also made Eagle Vs. Shark. So, there are some experienced comedic minds both in front of and behind the camera. The bulk of the jokes in the film are a mixture of subtle and absurd, and most juxtapose everyday life with that of a vampire. Thus, we get jokes about cleaning the house and how to keep the house clean when you are killing people in it, how vampires procure clothing, and how they judge their look when they have no reflection. We also see how a simple night on the town can be a challenge to the undead (the difficulty with bouncers is very funny). The funniest moment in the film comes during a montage of "family photos" featuring the group. As a horror movie fan, I found the notion that Petyr looks just like the vampire from Nosferatu to be hilarious. So, there are some very funny moments in What We Do in the Shadows. The problem is that there aren't enough of them. I've mentioned in the past that given how many brain-dead movies I watch that I never want to knock a movie for having a detailed script, but What We Do in the Shadows is simply over-written. There are too many subplots which steer the movie away from the main point, which is the interactions between the vampires. Vladislav lives in fear of a creature who bested him years ago. (And the twist with this is pretty easy to guess.) Viago laments a love which he lost while moving to New Zealand. Deacon has a human familiar named Jackie (Jackie van Beek) who does favors for him. As noted above, the local werewolves come in and out of the film. (Although, granted their odd pact to not use profanity is funny.) The movie really gets side-tracked with the young vampire. It's as if Clement and Waititi made a list of things which could happen to a vampire and decided to keep them all. The other problem is that some of these side-stories are somewhat serious in nature and don't lend themselves to comedy. So, we are left with a seemingly funny film which allows itself to move away from the actually humorous material. In the end, What We Do in the Shadows is a disappointment. The humanization of the vampires leads to some laugh-out-loud moments, and when their frustrations parallel those of everyday people, the movie is spot-on. However, it bites off way more than it can chew and after a promising opening, the movie navigates far too many tributaries, getting further and further away form those funny early scenes. All of the actors are good, the production design is great, and I loved some of the ideas in the movie, but I came here to laugh and there simply wasn't enough funny stuff. What We Do in the Shadows need more Petyr on Blu-ray Disc courtesy of Paramount Home Entertainment. The film has been letterboxed at 1.85:1 and the Disc contains an AVC 1080p HD transfer which runs at an average of 36 Mbps. The image is very sharp and clear, showing no overt grain and no defects from the source materials. The only defects here stem from the shooting style, as we get dark or blurry shots, but they have nothing to do with the transfer. The colors look fine, and the reds really stand out here. The level of detail is good, as is the depth. The Disc carries a DTS-HD Master Audio 5.1 track which runs at 48 kHz and an average of 4.0 Mbps. The track provides clear dialogue and sound effects. The stereo effects are good, showing nice separation. The same goes from the surround effects. Combined these do a good job of highlighting various sounds coming from around the apartment. We get some notable subwoofer effects during the action scenes. 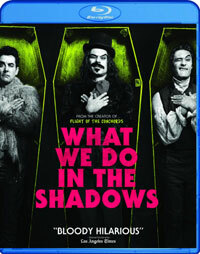 The What We Do in the Shadows Blu-ray Disc contains a handful of extras. We begin with an AUDIO COMMENTARY from Jemaine Clement and Taika Waititi. "Behind the Shadows" (18 minutes) is a reel of "fly-on-the-wall" on-set footage which focuses on specific scenes being shot, most of which show involved special effects make-up, stunts, and a revolving set. The Disc contains twelve DELETED SCENES which run about 32 minutes. Some of these are brand new scenes, but they don't involve characters not seen in the film. "Video Extras" is a series of nine shorts, including the "Original Short Film" which run about 50 minutes, and involve bits that feel like deleted scenes and promotional pieces. There are six "Interviews" (19 minutes) with characters from the film, which, again, feel like deleted scenes. Not unlike the six "Promo Videos" (7 minutes). The final extra is a POSTER GALLERY.